NEW YORK: McDonald’s Corp, which is trying to shake its image for serving processed junk food, said on Monday that it would eliminating some unpalatable ingredients from its most popular menu items. That includes making Chicken McNuggets and other items without artificial preservatives, and removing high-fructose corn syrup from its burger buns. McDonald’s did not immediately respond when asked about which specific preservatives are being removed. The changes come as the world’s biggest burger chain fights to win back customers after three straight years of declining guest counts at its established US locations. Major restaurant chains are scrambling to step up the image of their food as they face more competition from smaller rivals promising wholesome alternatives. “Why go to the position of trying to defend them, if the consumer is saying, I prefer not to have that particular ingredient in my food?” said Mike Andres, president of McDonald’s US, during an event. 1. Do you still remember Happy meal? 2. 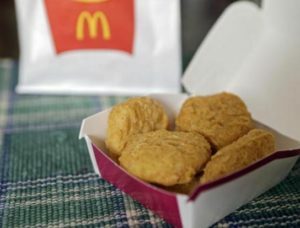 Do you agree with Golden Archers decision to overhaul some of Mcdonalds food product? 4. Do you know how many Mcdonalds outlets are there in your country? 5.What can you say about Mcdonalds facilities?